After my 20 hours visit in Tokyo, we traveled to Nagoya. I saw beautiful Mt. 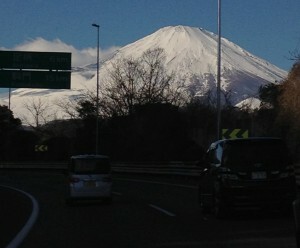 Fuji with snow from our car. The traffic was very smoothly from Tokyo to Nagoya. We arrived at Nagoya and had a delicious “Hitsumabushi” and got power. Hitsumabushi is a regional cuisine made with eel that is eaten mainly in the Nagoya area. 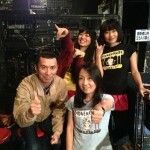 Photo: TAYLOW from Genbaku Onanies came to our show. 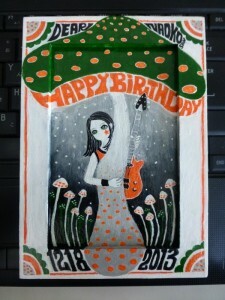 Thanks a lot! 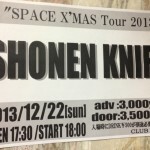 “Space Christmas Tour” was end here. We’ll start a new series from 2014. I’d like to make it more fun, more exciting one. Don’t miss it! 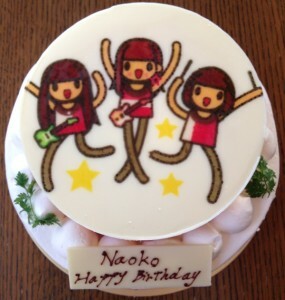 photo:　とってもステキな お誕生ケーキをもらった！I got fantastic Birthday Cake! This was the last “Space Christmas” tour. Why? Because we just wanted re-new and to start something fun from next year. This was one-man tour and we played 24 songs. For our set, we played “Get the WOW” for the first time after 20 years and 4 songs between the 12th and the 15th were food songs. It was the first time for us to play “All you can eat” in Japan. “Hot Chocolate” was played after a long interval. Ritsuko and Emi was singing with enthusiasm. The audience in my home town Osaka is so energetic. We had a very good time. Thanks! Then to be continued to Tokyo and Nagoya. 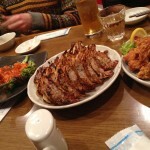 photo: 忘年会兼ねた打ち上げにて。おいしい中華。After party with Delicious Chinese cuisine. 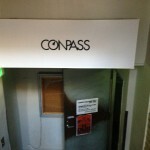 December 15th, at Conpass in Shinsaibashi, Osaka. 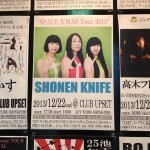 The 1st day of Space Xmas tour was in Osaka. 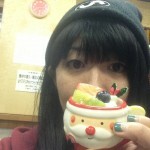 I played Get the wow, Wonder Wine, Hot Chocolate, All I Want For A Crhistmas for the 1st time. 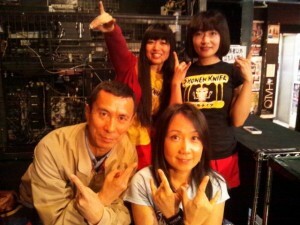 Especially, Shonen Knife played ”All I Want for・・・”for the 1st time!! That made me me so nervous. But Osakan fans are always so cheerful and energetic. They made me shift from tense to excited. We had an after party at a Chinese restaurant. It was an ”All You Can Eat and Drink”. I think dumpling is great with beer. She always helps us as a merch girl in Osaka. 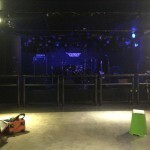 December 21th, at Fever in Shindaida, Tokyo. 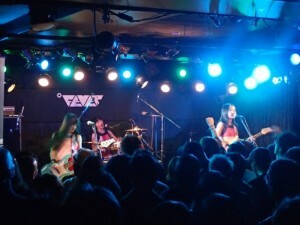 The 2nd day of the tour, I could enjoy a feeling of tension in Tokyo. But I felt tingle with their excitement. It’s not surprising because I see a lot of new fans in Tokyo these days. They are our staff in Tokyo. 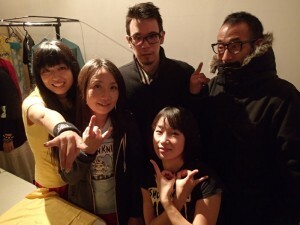 They are a member of Papalion, Pop Tune’s illustrator Mami Saitou, photographer Katsunaga. Always I should say thank you! 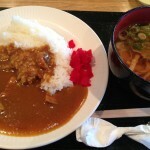 On the way to Tokyo, I had a Curry and Ramen set. They were good combination for me. December 22nd, Upset in Nagoya. The fainal show of the tour and this year!! I enjoyed to play at a relaxed state. I’m happy that Nagoyan new fans are increasing. 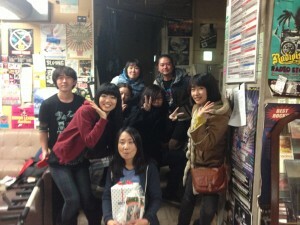 TAYLOW(From Genbaku Onanies) came to see us!! 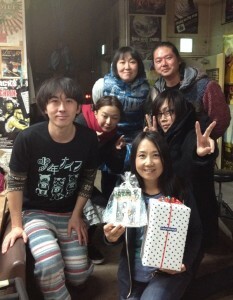 After the show, I ate a delicious cake. I wish you are a Merry Christmas and a Happy New Year! !